In a Nutshell: As the innovator of the first freebie-focused site on the web, Marc McDonald has 20 years of online marketing experience providing people with free samples he posts on his website, TheFreeSite.com. He knows the value freebies can reap for companies looking to promote their brands and how freebies drive traffic to their sites. We recently got the opportunity to sit down with Marc, who was generous enough to share four lessons he’s learned over the past two decades that have been crucial to the success of his site and could be beneficial to those looking to market their own companies. In the mid-1990s when the Internet was taking off, Marc McDonald, who is now known as the man behind TheFreeSite.com, was working as a copy editor at the Fort Worth Star-Telegram. Print journalism was already starting to feel old-fashioned, and, after spending time on early online services like Prodigy, Marc developed an interest in a new online frontier. What started as a hobby began to grow into a career opportunity. His first site, Dr. Webster’s Web Site of the Day, a site where he featured other popular websites daily and wrote reviews on them, gained traction and a loyal following. After he’d written enough of these daily entries, he needed a place for the reviews to live so he began organizing the sites by category. That’s when he noticed that the corner of his site dedicated to freebies was driving most of the traffic on his site. 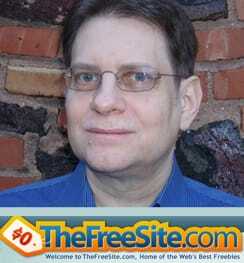 In 1997, he launched TheFreeSite.com, a carefully curated website devoted to helping users find free samples and helping companies promote their brands by driving traffic through giveaways. Marc McDonald was able to quit his job as a newspaper copy editor in 1999 thanks to the success of his website. Now nearly two decades out of print journalism, shifting his attention to helping people find freebies through TheFreeSite.com seems to have been the correct decision for the Fort Worth, Texas, resident. Over the last two decades, Marc gained a unique perspective on running websites and using free samples as a marketing tool, and he shared with us some of what he’s learned as well as helpful tips for aspiring site owners and companies that want to boost their brand through online marketing. About 70 percent of the freebies Marc lists on his site are emailed to him by companies in need of his promotion help. The other 30 percent are from Marc seeking free stuff on the web himself. Marc carefully vets every post on his site, even listing them by popularity. He carefully vets every freebie, first ensuring it is family friendly because that’s one of his personal priorities. He also checks for hidden costs and makes sure the sample is worth listing for his users. Online freebies are great for any size business because there is a limitless supply of digital goods whether it’s downloadable material or a free coupon for the shopper’s next purchase. These kinds of online offers help drive traffic. According to a Time article on the power of free samples, shoppers that are given freebies are more likely to buy the products given away and become loyal customers. This is due to a psychological phenomenon in which people that are given something for free feel obligated to reciprocate by buying the item. Another great digital gift? Free entry into giveaways or sweepstakes, which introduces prospective customers to lesser-known brands. Marc advises businesses, especially small ones, to think ahead about potential problems that could arise from free sample offers. For instance, a small company offering freebies can run into situations where their offers spread like wildfire on social media, and the company runs out of the sample. Web traffic continues to mount, but potential customers leave disappointed upon their first visit to the site. In a Forbes marketing article, companies that plan ahead and ensure resources for special offers can help expand their client base. Marc also believes credibility is one of the most important qualities you can have in business. “I’ve found over the years that the word ‘free’ is very much abused on the web,” Marc said, mentioning that many allegedly free offers have some sort of hidden cost, such as shipping and handling charges. “If you’re offering something that claims to be free and people go to your site and they find it’s not free, they’re going to wonder what else you’re not telling the truth about,” Marc said. Marc has noticed a trend of businesses that are trying to promote themselves by going straight to Facebook to set up a page, but he recommends only using social media to drive traffic to your own site. A Forbes article on the don’ts of social media urges companies not to ditch the control a company website provides to focus solely on social media. Corporate sites are among the few places on the Internet where companies can present their brands the way they want and control their message. 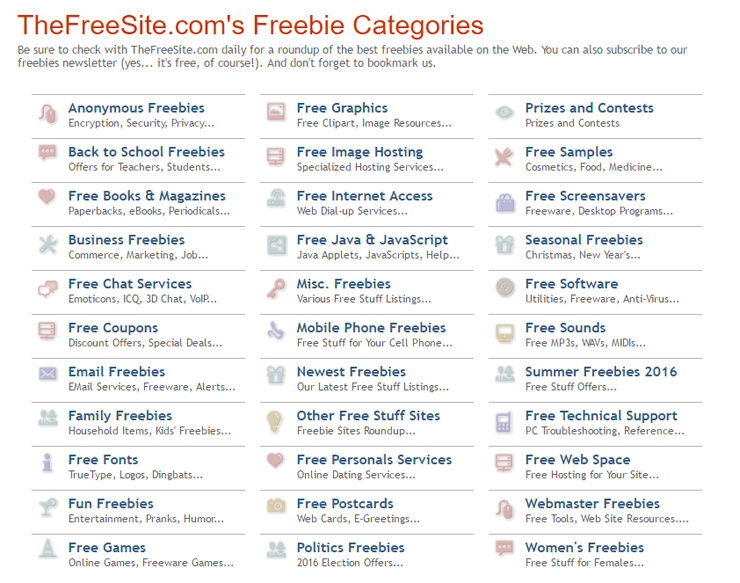 Marc organizes his freebies into categories on his site, something that’s possible because he controls his content. Besides having full control over your content, there are other advantages to owning a website that extend beyond gaining ad revenue from web traffic. The first is you can devote more space and tools to marketing. Social media can often limit what you can do, but owning a website creates endless possibilities for enhanced features like videos, customer reviews, and promotional offers. Having your own website also boosts your company’s credibility. Consumers expect any reputable business to have its own website, so if they find only a social media page, it could raise questions about your operation. Marc essentially runs TheFreeSite.com by himself, but he says it’s important to know when to farm out work. With his journalism background, his skill set is more in the vein of writing and marketing strategies, so he outsources any coding or programming to other reputable companies. He relies on Liquid Web for hosting and MailChimp for handling his email marketing. Marc uses MailChimp because it’s a reliable option for his popular freebie newsletter. Free options exist for email and web hosting, but according to Marc, you get what you pay for. For example, when your business depends on quality tech, it’s important to not go the cheap route for your providers. Marc’s favorite parts of the year are the major holidays, and not because of the eggnog or trick-or-treating. He finds that freebies that tie into holidays tend to get a lot of attention on his site. And what Marc has found to be true makes sense, especially when you look at how much money goes into holidays. The holiday season alone can represent as much as 30% of a retailer’s annual sales, based on the National Retail Federation’s holiday facts, and it doesn’t include other big-spend events like Valentine’s Day. Marc’s only regret in leaving the newspaper business is that he has to pay for his own health insurance. He’s learned much over the past two decades of freebies, most specifically the universal truth that every consumer wants something for free. However, companies need to find a way to market those freebies to potential new customers and bring in traffic for more conversions. Submitting your free sample offers to a site like TheFreeSite.com is a great way of getting the word out, especially with Marc’s 20 years of experience in online marketing. “If you have the resources, nothing brings more traffic than free samples,” Marc said.